Would you like to move your forms from Ninja Forms to WPForms? With our form importer tool, you can easily bring your current forms into WPForms. 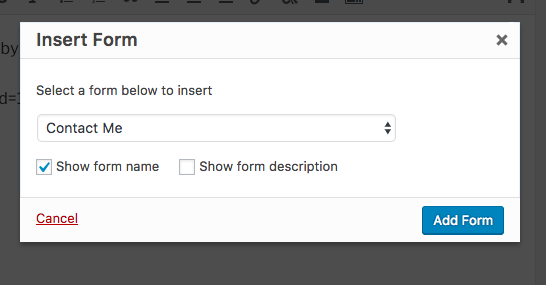 In this tutorial, we’ll cover how to import forms from the Ninja Forms plugin to WPForms. To open our form importer tool, you’ll need to go to WPForms » Tools. Once there, scroll to the section titled Import from Other Form Plugins. In the importer dropdown, you’ll be able to select Ninja Forms as your previous forms plugin. Once you’ve made this selection, you can click the Import button. Next, you’ll be able to select which specific forms you’d like to bring in from Ninja Forms. Under the Available Forms column, you’ll see all the detected forms. 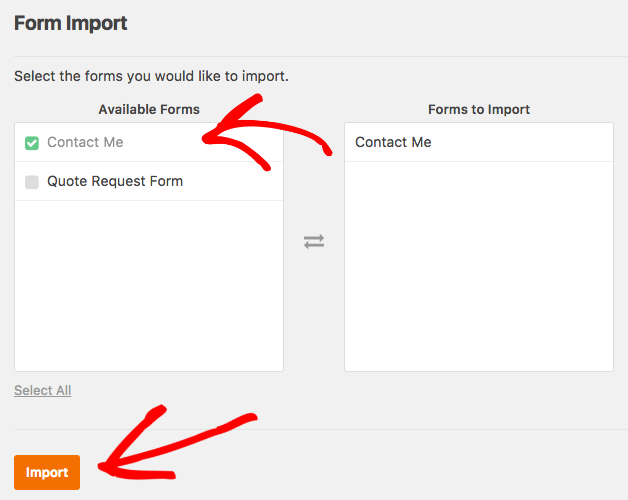 Any forms you select here will be added to the Forms to Import column. 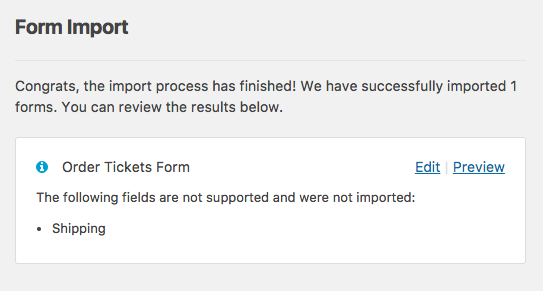 If a field isn’t compatible, the importer tool will notify you that it couldn’t be imported. Our importer tool will also copy notification email and confirmation settings from your existing forms into your new WPForms. For more details on customizing these settings, be sure to check out our tutorials on setting up notification emails and choosing confirmation settings. Please always review and test your imported forms to be sure everything is set before adding to a live page or post. 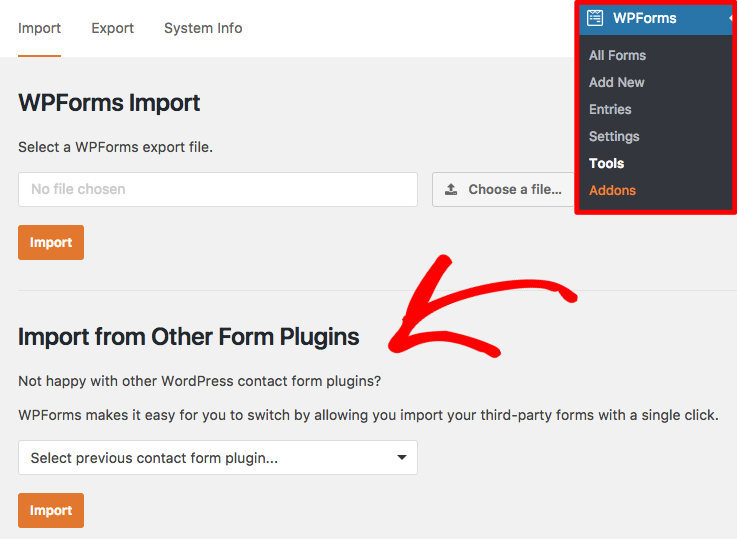 Now that you’ve reviewed your imported forms, you can go ahead and embed them in your WordPress site. To replace your previous forms with WPForms, you’ll need to swap out your Ninja Forms shortcode with the shortcode for WPForms. To do this, you’ll need to open the page editor where an existing form is embedded and click the Add Form button. If Ninja Forms is still active on your site, you may see their Add Forms button, as well. To avoid confusion, you can either deactivate Ninja Forms or use the Embed button in the form builder. From there, you can copy the WPForms shortcode and paste it in any page or post. From the Insert Form overlay, you’ll be able to select the form you’d like to add. Then, you can choose whether you’d like to display the form’s title and/or description. 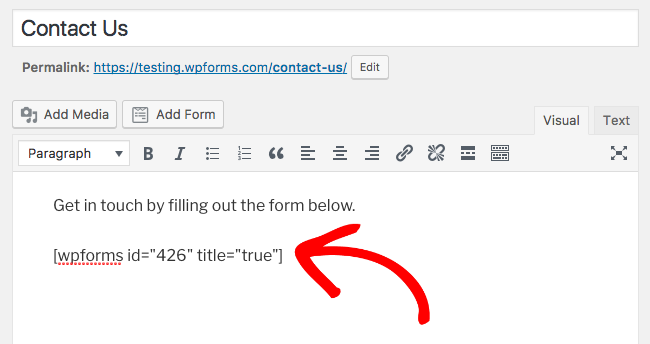 When you click the Add Form button, the WPForms shortcode will be added to your page editor. That’s it! You’re now able to quickly bring in your forms from Ninja Forms to WPForms. Next, would you like to learn about how form entries work in WPForms? Be sure to check out our guide to form entries for all the features available for entry management.